Note: Performance metrics in Portfolio Manager have been updated to reflect the most recent market data available. If you own or operate a building in the U.S., you may notice a change in your 1-100 ENERGY STAR score or other metrics. For more information, visit www.energystar.gov/scoreupdates. You’ve heard it before: you can’t manage what you don’t measure. That’s why EPA created ENERGY STAR Portfolio Manager®, an online tool you can use to measure and track energy and water consumption, as well as greenhouse gas emissions. Use it to benchmark the performance of one building or a whole portfolio of buildings, all in a secure online environment. 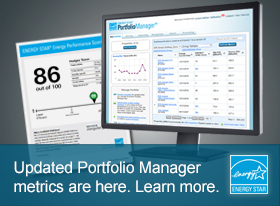 You can use Portfolio Manager to manage the energy and water use of any building. All you need are your energy bills and some basic information about your building to get started. Are you designing a new commercial building? You can also use Portfolio Manager to set your energy use target and see how your estimated design energy stacks up against similar existing buildings nationwide. When you add your buildings, you’ll be joining 40 percent of U.S. commercial building space that’s already benchmarked in Portfolio Manager — making it the industry-leading benchmarking tool. You’ll also be joining more than half of the Fortune 100®, half of the largest U.S. healthcare organizations, major league sports teams, colleges and universities, and entire cities. Use the links on the left and start managing your energy and water consumption today. Looking for Portfolio Manager technical support? Visit our help center. EPA's online energy management and tracking tool enables you to measure and track the energy and water performance of any building over time. What is the 1-100 ENERGY STAR score and certification for buildings? Easily see what information is required for your property and create a PDF or Word worksheet to help collect the data. Enter your zip code to find Licensed Professionals that have verified properties near you for ENERGY STAR certification.